Buried in the Egyptian desert some four thousand years ago, the Pyramid Texts are among the world’s oldest poetry. Yet ever since the discovery of these hieroglyphs in 1881, they have been misconstrued by Western Egyptologists as a garbled collection of primitive myths and incantations, relegating to obscurity their radiant fusion of philosophy, scientific inquiry, and religion. Now, in a seminal work, the classicist and linguist Susan Brind Morrow has recast the Pyramid Texts as a coherent work of art, arguing that they should be recognised as a formative event in the evolution of human thought. 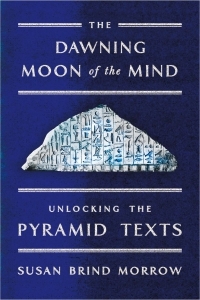 In The Dawning Moon of the Mind she explains how to read hieroglyphs, contextualises their evocative imagery, and interprets the entire poem. The result is a magisterial religious and philosophical text revealing a profound consciousness of the world with astonishing parallels to Judeo-Christian culture, Buddhism, and Tantra. More than twenty years in the making, The Dawning Moon of the Mind is a monumental achievement that locates one of the origins of poetic thought in Western culture. Almost before science, art, and written language, these texts set forth the relationship between time and eternity, life and death, history and ideas. In The Dawning Moon of the Mindthey emerge in their original luminosity and intelligence alongside a persuasive argument for their central importance to the history of language. A stunning and original interpretation of an ancient system of poetic, religious, and philosophical thought.